Three recent contracts awarded to the Gaylin Group of companies (of which Rigmarine is part) substantiated their collective status as a major global specialist provider for turnkey wire rope supply and installation packages. Progressive development of deeper water exploration, supported by new-build state-of-the-art deep-water construction and offshore support vessels have transformed the spooling industry. From mundane spooling of 25-tonne wire to critical logistical and operational scopes of work, the sector demands hours of planning, top of the range tensioning equipment and, of course, knowledge and expertise. Recently, a number of extensive fibre rope spooling and tensioning projects have been executed by the group, each of which, Duncan says, brought with them their own challenges, but also a satisfying level of achievement and knowledge to all involved. Three projects in particular provide testament to this the point. Two case studies presented a simultaneous challenge to install A&R wire rope packages aboard vessels in Malaysia and Azerbaijan respectively. One docked at Johor Port required 109 mm x 3,000 m, 160-tonne capacity rope. 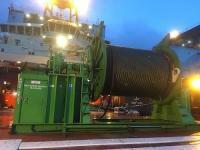 In Baku, aboard another, 112 mm x 3,000 m rope of 155-tonne capacity was the order of the day. Duncan reflected on the scale of both projects, recalling local mobilisation of engineers and machinery from Gaylin’s offshore marine base in Johor and Rigmarine’s Azerbaijan facility. Each location provided an engineering team of at least 12 people, including project management as well as two spooling machines of over 200-tonne capacity. A winch test system was provided to the same project with specific components, such as a 500t triplate, 500-tonne wide body load measuring shackles and synthetic grommets. Both projects were completed within budget, on time and without incident, Duncan adds. Finally, and most recently, Rigmarine mobilised a team from its new UK operation, comprising a project manager, mechanical fitter, machine operator and two qualified wire rope technicians, to assist with the installation of over 6 km of 90-mm diameter AHTS wires, all of which were provided by Rigmarine Europe UK. A bespoke all-weather socketing and rigging facility, in addition to a 250-tonne self-contained back tension spooling machine, supported the team. Also part of the package was a rigging and test equipment loft, including water bags and load cells to test the vessel cranes. The project was completed ahead of schedule, allowing the vessel to depart and take up charter. Duncan highlighted the fact that this was the first of six new-builds for which Rigmarine Europe UK has the supply and installation contract.